It’s hard to imagine that we’d ever get this far but we are now in the process of laying the floors. The push for this began with an effort to get rid of the portable outhouse. The $120 a month rental fees have been a thorn in our side for nearly a year as project delays have held up the completion of the indoor plumbing but that’s another story. So, what does this have to do with floors? 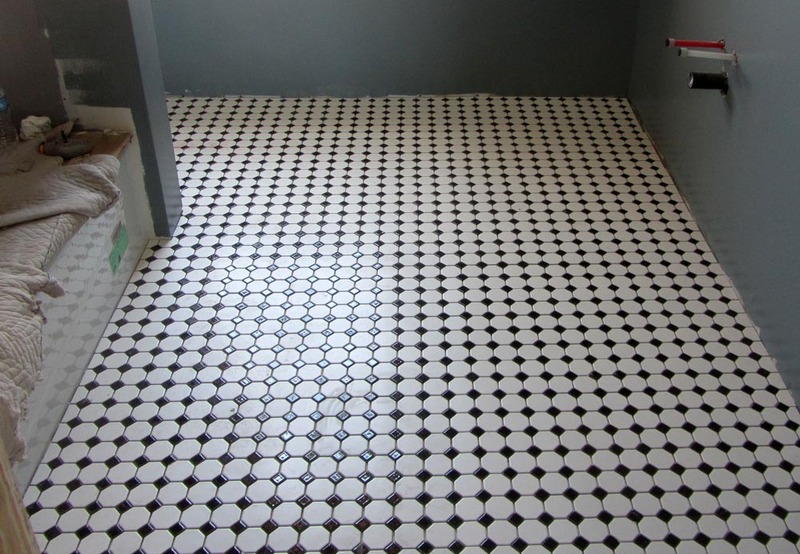 Well, we couldn’t install a toilet without having the tile work done first. 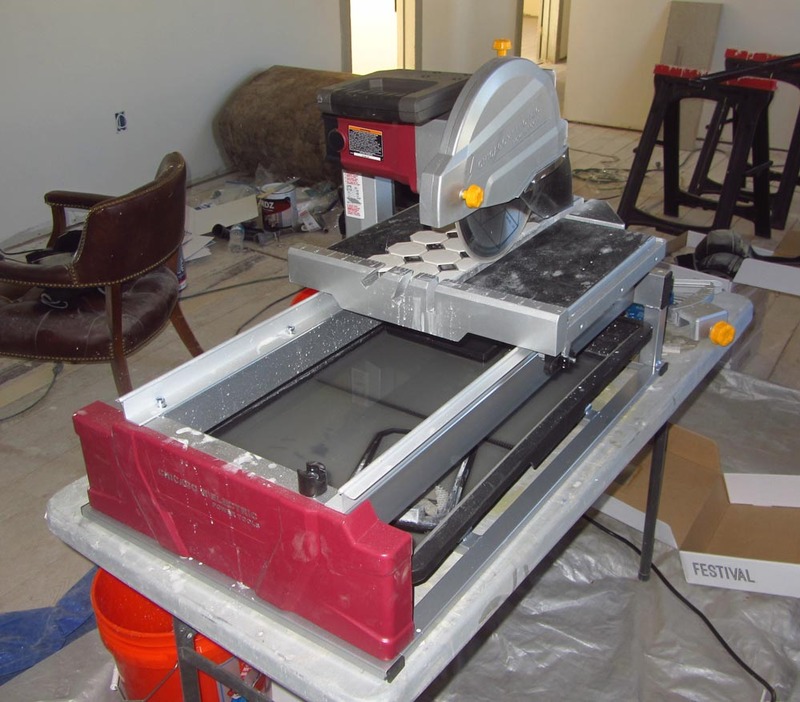 So, I finally unboxed the unused Harbor Freight tile saw that’s been collecting dust for months. This model rated really well with users and with a 20% off coupon, it was half the price of the similar Home Depot model. Now, I’ve tiled a couple of shower stalls in the past with 12″ square tiles but only a small part of that experience translated to setting a bathroom floor with antique style hex tiles. Trying to keep these guys straight was quite a challenge particularly in the hot weather with the mortar drying too quickly. Once set in place, the tiles were pretty much stuck with little chance to adjust placement which led to moments of panic and frenzied cursing. In the end; however, the results were pretty impressive. Meanwhile, we took a brief break to receive the wood flooring we had ordered. 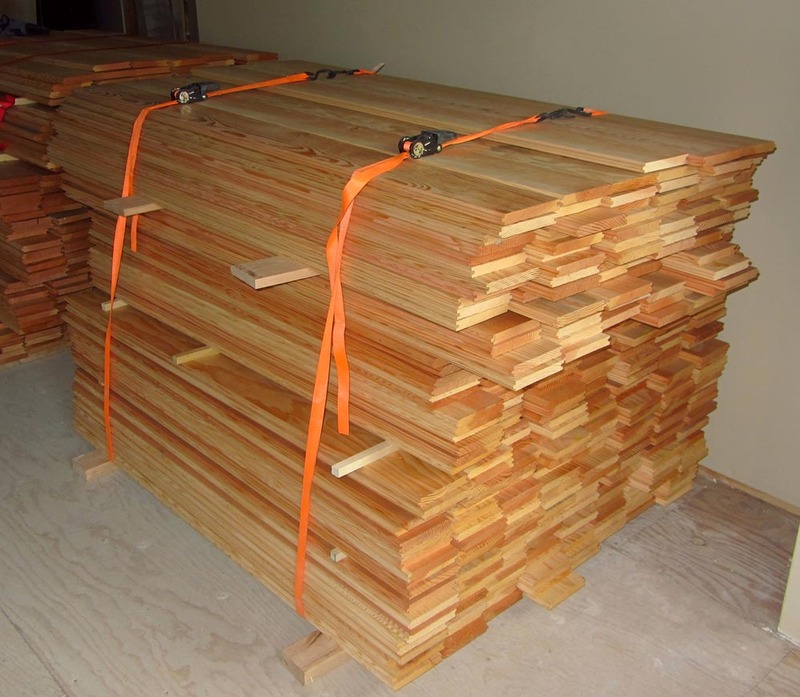 We were originally looking at yellow pine but we stumble across a mill that had a large quantity of mixed grain fir from a canceled order. This was fortuitous because the fir looks more like the original hotel floors than the pine would have. Of course, nothing is every easy around here. There is a high curb at the front of the hotel which prevented the delivery driver from wheeling the wood in on a pallet jack. Instead, he dropped the pallets in the street and Katie, I and a friend, lugged it all in by hand. The wood is now stacked in the saloon where it will stay for another week or two. It has to acclimate to the local humidity and the straps you see are to keep it from warping before we can nail it down. On the matter of warping, there was another concern we had to deal with. Some of the original plank floors upstairs had taken so much water damage over the years that they had become badly cupped. The worst of it was in Katie’s future office so I set about nailing down the existing planks with 2″ galvanized nails to stop any squeaking or bouncing. I normally would have used screws for this purpose but the pine floor joists were so soft that the screws weren’t getting a strong bite. On the other hand, galvanized nails are known for their ability to grip which they did well in this case. After nailing everything down, I then used the belt sander to knock down the high edges of the cupped boards. 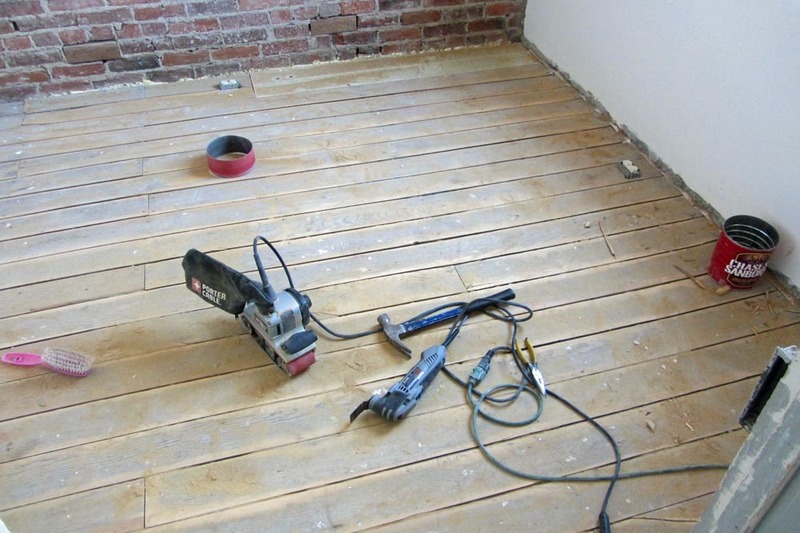 The new floor boards will be run perpendicular to the old ones so with luck, it will be pretty flat and solid. We have our work cut out for us in the next couple of weeks but in the meantime, I’d like to ask if there are any locals who have the ability to make metal caps for our three abandoned chimneys? I made heavy wooden ones to cover the chimneys temporarily but mother nature keeps blowing them off on a regular basis. We need a permanent solution that I can attach with masonry anchors. Hello Dusty!! Just want to THANK YOU for the awesome tour my son Tim and I got the day last week we poked our heads in the front door! You and Katie are doing an AWSOME job to say the least and like I told you I would like to build you a scale model of the Hotel in an era of your choice!! Please contact me at my email address and we can discuss. Thanks again for the Tour and I will be following your progress each month as you two bring the Union back to life! !